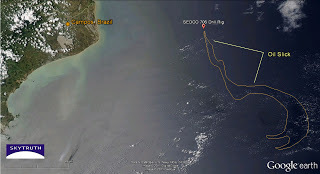 Campos Basin Oil Spill, Brazil – Slicks Dissipating? Envisat ASAR image of Campos Basin taken November 22, 2011. 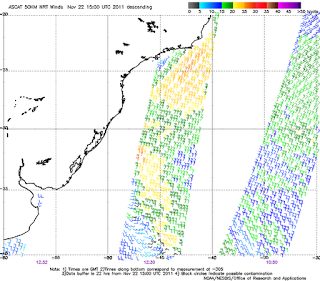 Surface winds too strong to reliably detect thin oil slicks. Bright spots are vessels and oil platforms. 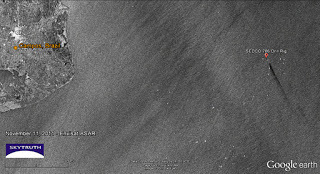 Image courtesy European Space Agency. Today’s Envisat ASAR satellite radar image of the Campos Basin, covering the location of the Chevron / Transocean oil spill, shows no sign of an oil slick. It was taken at about 9:30 am local time. 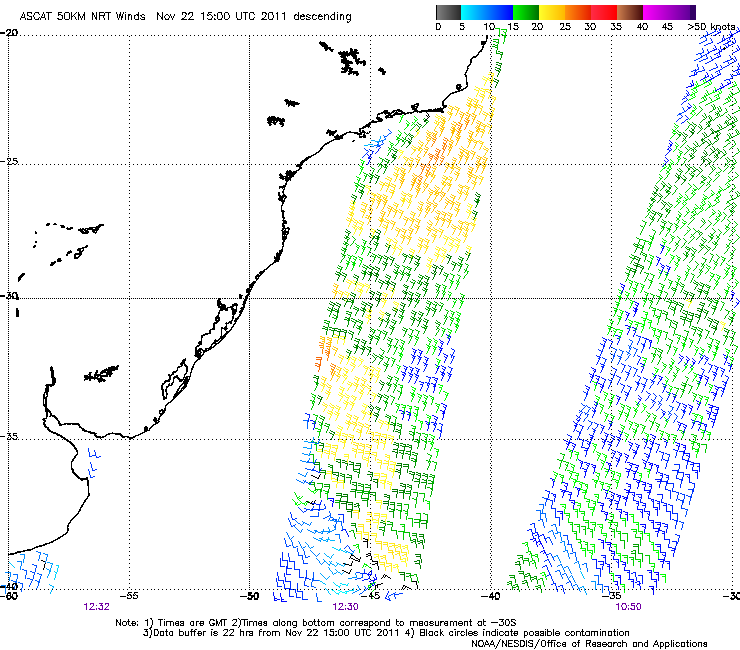 Surface wind speed and direction derived from ASCAT scatterometer data at nearly the same time as the November 22 radar satellite overpass. 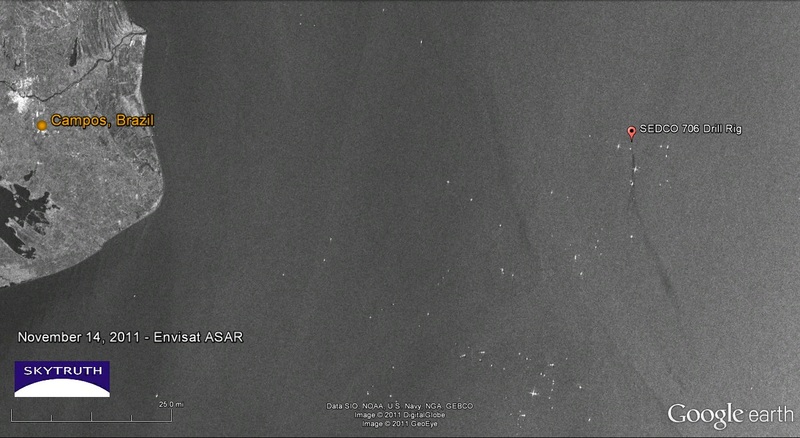 Envisat ASAR image taken November 11, 2011. Image courtesy INPE. Envisat ASAR image taken November 14, 2011. Image courtesy INPE. We are cautiously optimistic that this spill has been brought under control. We’re hoping for a few more radar images in coming days, taken under moderate wind conditions. We will update you here when we see anything interesting. 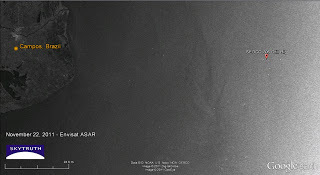 https://skytruth.org/wp-content/uploads/2011/11/SkyTruth-Campos-oilspill-ASAR_11nov2011.jpg 174 320 John Amos /wp-content/uploads/2016/08/test_logo.png John Amos2011-11-22 17:59:002019-02-22 11:03:56Campos Basin Oil Spill, Brazil - Slicks Dissipating? Photo from an overflight by a Navy helicopter on 24 Nov 2011, which included ANP technicians. Included in an ANP news release. While we’re still waiting on clear satellite imagery from the area (and radar imagery, coming next week), the aerial photograph above was taken during an overflight on the morning of November 18 off the Campos Basin along the coast of Brazil. According to Chevron and Brazilian authorities, the well is now sealed. BBC News also has a short video clip showing aerial footage of the spill and the vessels in the area trying to clean up the mess. Brazil’s oil agency, ANP, said underwater images showed Chevron’s effort to permanently seal the well with cement appeared to have been successful, although there appeared to be a residual flow of oil from the seabed. We are still waiting to get more good satellite imagery of the Chevron / Transocean oil spill in the Campos Basin – it’s been cloud-covered since our last image on November 12, so we’ve been unable to provide any new information. 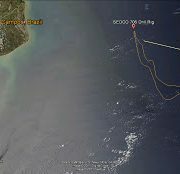 But we are happy to pass along that Brazilian authorities report the well was plugged yesterday with cement, and the leakage from nearby points on the seafloor is greatly diminished. We expect to see a much smaller oil slick, if any, when we get another good satellite image of the area. 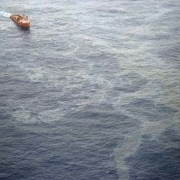 Brazilian Federal Police have launched an investigation into the causes and size of the spill. We hope all of this information becomes public: deepwater drilling is a global business and these were two of the biggest global players, so lessons learned from this incident will apply here in the U.S. too. The Campos Basin has been cloudy so we haven’t gotten a good satellite image of the Chevron oil spill there since November 12. Chevron reported yesterday that their top-kill operation has stopped the flow of oil at a well they had been drilling from the Transocean SEDCO 706 semisubmersible drill rig, and “significantly reduced” the flow from from a line of nearby seeps that may have been fed by oil from the well. It seems like they may have had a casing failure below the seafloor, but we need to see a lot more technical detail about what happened. Chevron and Transocean are major global players, very active in US waters, so whatever went wrong off Brazil is important information relevant to deepwater drilling everywhere. 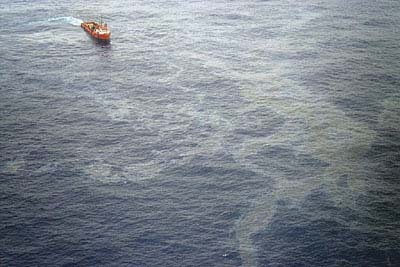 Let’s not make the mistake of dismissing this spill as irrelevant to US drilling practices, like we did after the 10-week-long blowout and oil spill off Australia in 2009. These incidents are warning shots that we ignore at our peril. We’ll keep looking for good satellite imagery of this spill – hopefully showing the oil slick dissipating – and will update you all here and at SkyTruth Alerts whenever we produce anything new. Chevron Oil Spill off Brazil – 10 Times Bigger Than Official Estimate? We’ve been tracking the oil spill reported off Brazil a few days ago, in the Frade field operated by Chevron in the Campos Basin, Brazil’s most productive area of offshore production, and a place where many deepwater technology milestones have been made for offshore oil production. Chevron claimed the oil slick was being caused by a natural oil seep on the seafloor, but they suspended drilling on a well in the field. Brazilian authorities quickly disputed that a natural seep was the cause. And yesterday Chevron admitted the possibility that something went wrong at their drillsite. According to today’s news release from Brazilian authorities, Chevron is trying to kill the well – indicating a loss of well control and blowout. 18 response vessels are on the scene, and Chevron reports the well is leaking about 8,400 – 13,860 gallons (200 -330 barrels) per day. MODIS/Aqua satellite image shows growing oil slick in the deepwater Campos Basin off Brazil. Image taken around midday on November 12, 2011. Based on Brazilian government data showing the locations of active drill rigs, provided to us by some of our very helpful followers on Twitter, we conclude that Chevron’s well was being drilled by the SEDCO 706 semisubmersible drill rig operated by – wait for it – Transocean. Yes, the same company that operated the doomed Deepwater Horizon rig for BP. The MODIS/Aqua satellite image from NASA, above, was taken three days ago. 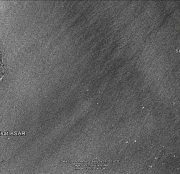 It shows an apparent oil slick originating from the drilling location and extending over 2,379 square kilometers (the south end of the slick gets entrained in an interesting clockwise eddy in the ocean currents). At 1 micron thickness, that’s a volume of 628,000 gallons (14,954 barrels) of oil. Assuming the spill began midday on November 8 (24 hours before we first observe it on satellite imagery), we estimate a spill rate of at least 157,000 gallons (3,738 barrels) per day. That’s more than 10 times larger than Chevron’s estimate of 330 barrels per day. https://skytruth.org/wp-content/uploads/2011/11/SkyTruth-Campos-oilspill-MODIS_Aqua_12nov2011.jpg 174 320 John Amos /wp-content/uploads/2016/08/test_logo.png John Amos2011-11-15 17:39:002019-02-22 11:05:28Chevron Oil Spill off Brazil - 10 Times Bigger Than Official Estimate?